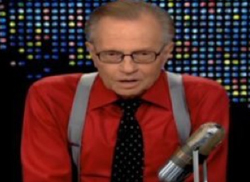 Larry King said he’d leave his CNN show this fall, but the New York Post reports that the network has asked him to stay on longer. It is all but confirmed that CNN will install Piers Morgan as its new host at 9PM, but there’s been no official announcement despite weeks of speculation. What’s the hold-up? According to the Post’s Michael Shain, it’s Morgan’s visa. As a British citizen, Morgan needs a special visa that will allow him to work full-time in the US — and those types of visas are increasingly difficult to get, according to lawyers who specialize in the field. In general, the process “has gotten much slower in the past year” as the federal government tightens paperwork requirements for immigrants, says one attorney. As a result, CNN has reportedly asked King to stick around until the end of the year. The host “is said to have jumped at the chance to extend his stay,” Shain reports.